The inauguration of the world’s largest Solar Hybrid power plant was attended by representatives from Iamgold and Wärtsilä, as well as the President of Burkina Faso, Mr Roch Marc Christian Kaboré. The technology group Wärtsilä today announced that it has delivered the world’s largest solar hybrid power plant. Wärtsilä will provide a reliable and sustainable supply of round-the-clock energy which is essential in operating the off-grid gold mine and demonstrate the enormous potential of integrating renewables as the baseload electricity. Wärtsilä was selected by the global renewable energy independent power producer Total Eren SA and African Energy Management Platform (AEMP) to build a 15MWp solar PV plant that shall generate and deliver energy to Iamgold Essakane SA at its gold mine in north-eastern Burkina Faso. By hybridizing an existing 57 MW diesel power plant with the new solar PV plant and related hybrid plant controls, the plant’s performance has been significantly enhanced. The new solar hybrid plant configuration maximizes the utilization of renewable energy at the Essakane mine. It is estimated that this will reduce fuel consumption by some 6 million litres per year, while reducing the plant’s annual CO2 emissions by as much as 18,500 tons. This project has generated more than 200 employments during the construction phase and is expected to create 75 permanent jobs during the operation phase. “This project demonstrates the benefits of integrating renewable energy in the mining industry. We are looking to replicate this type of hybridisation, especially in Africa where mines cannot always rely on the national grid. Renewable energy coupled with either storage or thermal-based power generation represents a truly viable option for industrial consumers since it enables for competitive, reliable and clean power supply,” explains Fabienne Demol, Executive Vice-President - Global Head of Business Development, at Total Eren. 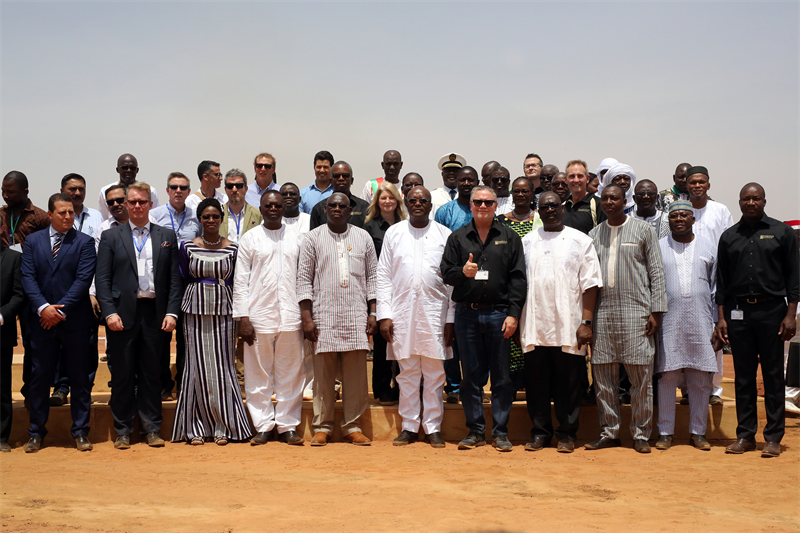 The inauguration of the new power plant, located approximately 350 kilometres northeast of Burkina Faso’s capital city, Ouagadougou, took place on March 16th and was attended by representatives from Iamgold and Wärtsilä, as well as the President of Burkina Faso, Mr Roch Marc Christian Kaboré. A common theme throughout the proceedings was recognition of the success of this project and the growing potential for similar hybrid solutions, particularly on the African continent. Wärtsilä has been contracted to operate and maintain the plant under an Operations & Maintenance agreement. With this project, Wärtsilä has over 7 GW of installed capacity in Africa. Image caption: The inauguration of the world’s largest Solar Hybrid power plant was attended by representatives from Iamgold and Wärtsilä, as well as the President of Burkina Faso, Mr Roch Marc Christian Kaboré.